Winners of four consecutive games for the first time since March of 2012, Chicago will try to make it five in a row when it hosts the Charlotte Bobcats on Monday night. Having Derrick Rose back in the lineup at full strength will certainly help. Rose sat out of practices last week with a sore right hamstring and did not face the Raptors in Toronto on Friday night. In the last two games, Chicago has shot 18-for-35 (.514) from behind the arc. He returned to post a season-best 20 points, including a career-high tying six three-pointers, in a lopsided win over Indiana on Saturday. 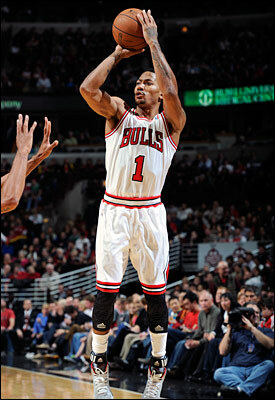 Rose participated in the team’s Monday morning shootaround, along with everyone else, said Bulls coach Tom Thibodeau. As for how Rose was able to get back on track, it’s simple. Now, as the Bulls prepare for their last home game before a six-game road trip ensues, they hope to carry over momentum from Saturday’s victory. But going back a few steps to what preceded this recent stretch, Thibodeau refers to a point just before his team’s last defeat as when things started to come together. “I actually thought it started in the days prior to the first Indiana game [on Nov. 6],” said Thibodeau. “We had a few days of quality practice time and I thought we played well in the game at Indiana. We didn’t finish the game as well as we’d have liked. Thibodeau continues to push his team towards striving for the ever elusive 48-minutes of perfection. His emphasis on concentration and effort, as well as not taking any plays off, feeds into building the right habits and ultimately more wins. While lately the offense has caught up with the defense, Thibodeau says the Bulls will push to be better in both areas. After a 1-3 start to the regular season, the Bulls hope the worst is behind them. Rose certainly sees it that way, while admitting he’s enjoying how well the team has looked as of late.